Welcome to Kannan Borewells ! 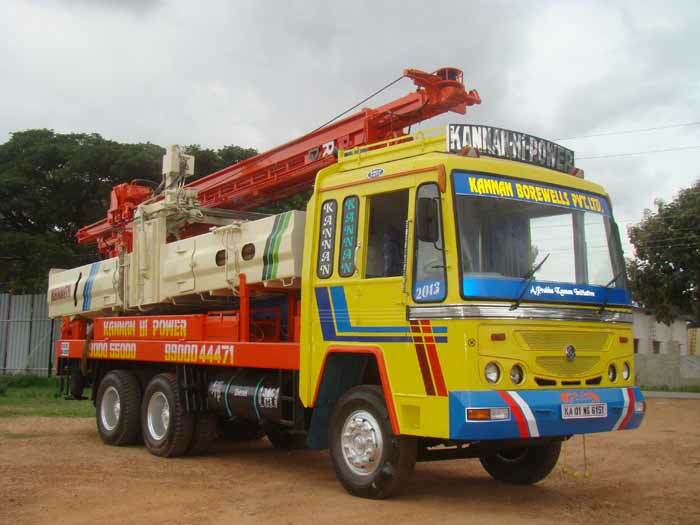 Established in 1971, Kannan Borewells Private Limited is a leading borewell drilling contractors in Bangalore. 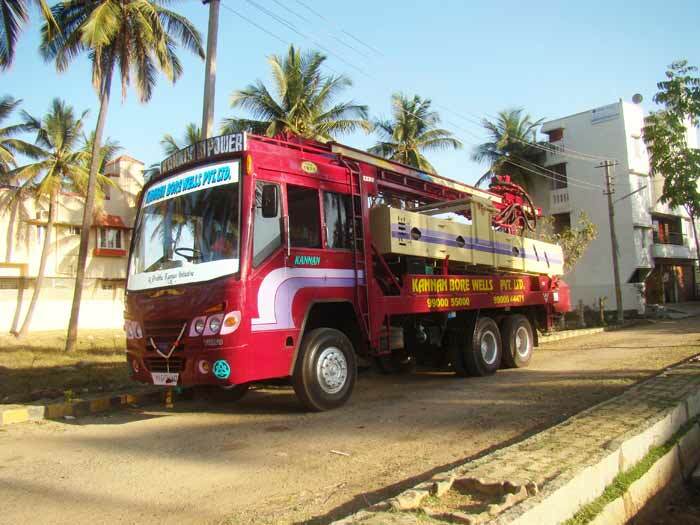 N K Kannan, our visionary founder, envisaged a valued based quality water well drilling unit to operate in and around Bangalore city. Today his dream has come true. 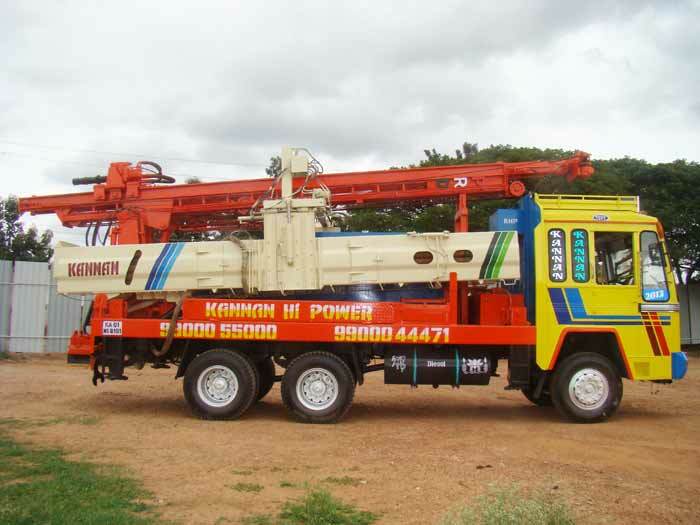 Kannan Borewells has made a big headway as a top class bore well drilling contractors, overcoming challenges in the competitive market without compromising on quality. 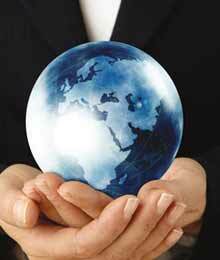 Adapting to emerging technological innovations and meeting the international standards is a value of the company. 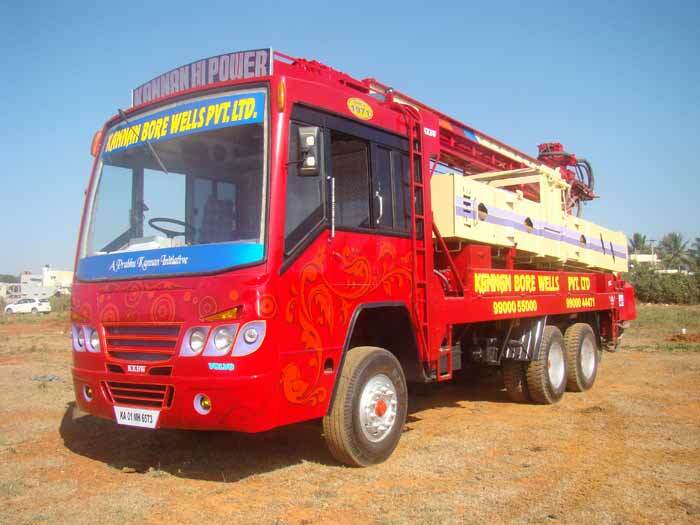 Blending traditional values with new age engineering technology in vogue, we offer world class borewell drilling services at affordable price. 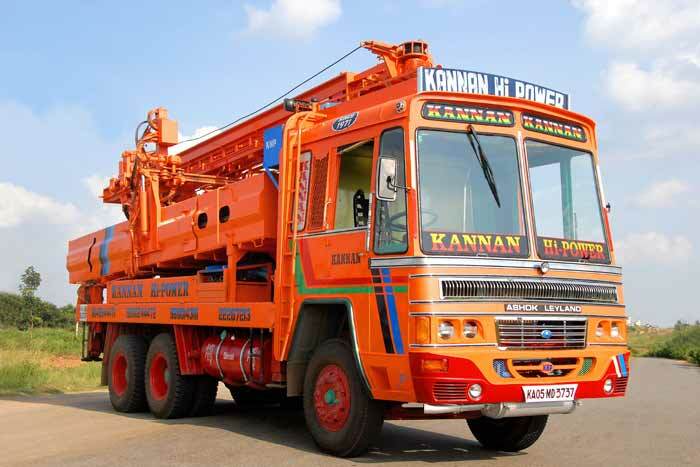 No wonder Kannan Borewells Private Limited is a tried and trusted name for drilling services in Bangalore. 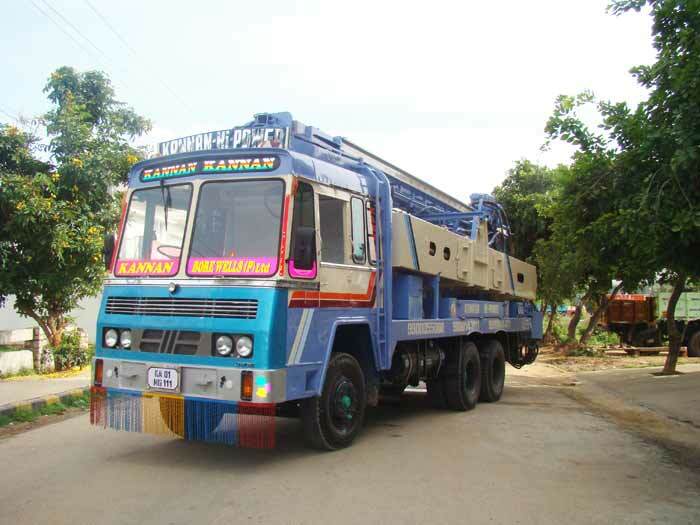 Kannan Borewells Pvt. 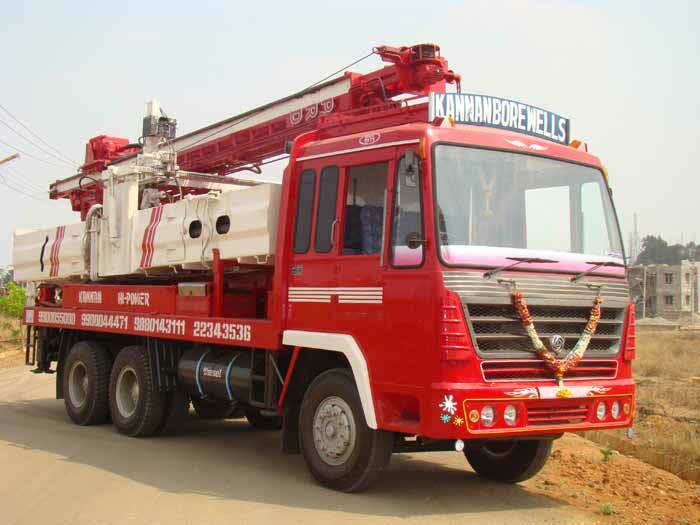 Ltd. is one of the leading bore well drilling contractors, offering wide range of drilling solutions to customers in and around Bangalore. 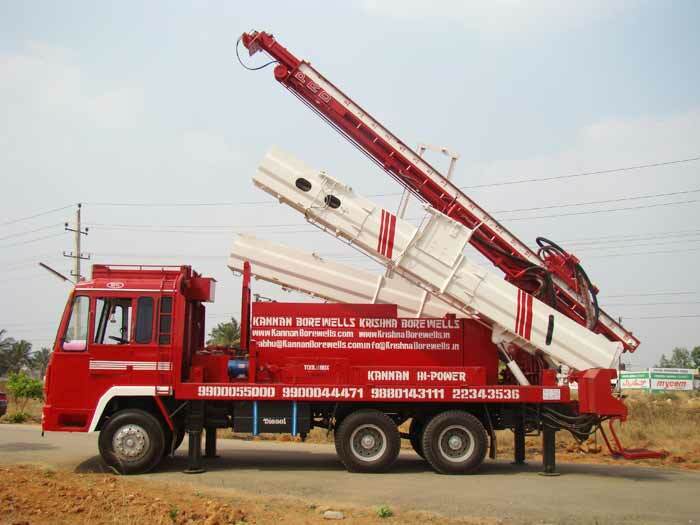 We are specialized in bore well drilling, water well drilling, tube well drilling; bore well consultant services, groundwater exploration and other related services. 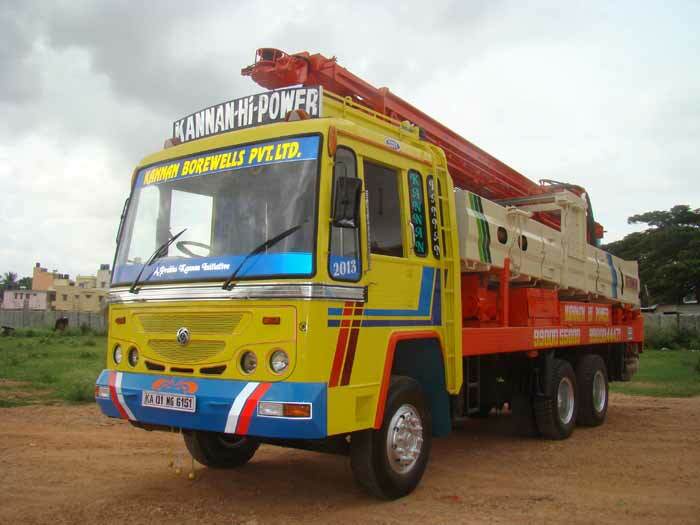 Our valued customers, individuals as well as prestigious organizations and institutions of the city have been immensely satisfied with our drilling services which incorporate cutting edge technology and machinery. Kannan Borewells Pvt. Ltd. was established in the year 1965 as a regional bore well water drilling unit in Tamil Nadu by our visionary founder Sri. N K Kannan. The company made a swift progress by building an enviable roaster of residential and commercial projects in Tamil Nadu. 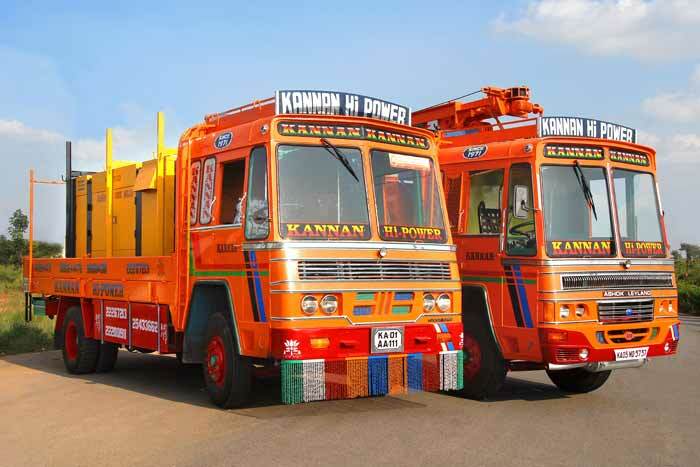 Responding to the growing demand in other states, especially Karnataka, Sri N K Kannan expanded company's operations by establishing Bangalore unit in 1971. Since then Kannan Borewells has not looked back. Today it ranks as one of the best bore well drilling companies in Bangalore providing wide range of drilling services to valued customers. In the year 2005, Sri N K Prabhu Kannan, son of Sri N K Kannan took over the reins of the company. Under his management the company also made a successful foray into overseas market. With its continuing success, Kannan Borewells has earned admirations from the business peers as well. The company's service is approved and recognized by TNWB, PHE, mines and geology, KAIC, BWSSB, KUWSSB and other reputed organizations. Our vision it to become one of the premier drilling companies in South Indian market and sustain that position through continuous technological upgradation and customer centric services. By blending global perspectives with native values, we would like to contribute to a better quality of life for generations to come. To provide our clients with the highest quality drilling services available in the market at affordable price. To build client relations on mutual respect and integrity. To offer customized professional services based on client requirements. To improve our skills and continue to upgrade our machinery as per the emerging standards. To develop new capabilities and to adapt technological innovations to meet the emerging challenges and changing needs. Our business is guided by traditional family value system incorporating values like honesty, integrity and fairness. Our commitment is to meet your goals on time and exceed your expectations with human touch. Quality: We offer and deliver quality water well drilling services to our valued customers. Quality also means that we carry out the work efficiently and complete it on time. We pledge to continuously innovate and upgrade in order to maintain industry standards. Excellence: We always set high standards, apply state-of-the art technology, and continue to innovate and improve. We thrive on tough challenges and accomplish them with ease. Ethics: Uncompromising integrity, honesty, fairness and respect are at the heart of our company. Fair Return: Our returns fairly reward the services that we deliver. It is a win-win situation for us as well as our clients. Mutual Respect: We work closely with our valued customers, who hail from diverse geographical and cultural backgrounds. We hold our client's beliefs and values system in high esteem. Mutual respect is a guiding principle irrespective of client's background and culture. Sustainability: The Company is always open for new technological innovations and up gradation. Our planning and action would always be guided by sustainability factor. The long- term benefit that our business provides is not just restricted to the company alone but also for the customers and the larger society. It's my pleasure gaining best information about process followed at installation. Kannan has expert Ground Water Surveyors to predict with accuracy. Saved my business time and provided satisfaction in each process. Thanks to kannan. 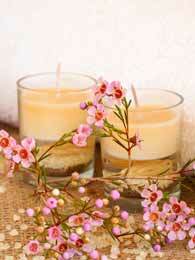 They have sufficient skills and knowledge which ultimately proved best service. Will certainly refer to others for kannan's professionalism. Proper examination by Geologists proved for better process handling. Neat explanation provided. Kannan is reliable. Their report was satisfactory by right method of analysis. They provided better service without lagging at work. Every process was supervised for best execution. Sincere thanks to Kannan, improved our living with right borewell installation method. Certainly, refer to my friends. Cost is reasonable. They deserve appreciation for systematic and planned service. Thanks to everyone in the team. Saved my time at the construction. Was helpful to carry out our works progressively. There was no hindrance at work. Team worked sincerely with less supervision. They proved their skills. Cost involved in the project was clearly explained. It was reasonable enough. Installation was followed with accurate scientific method. Respect their dedication towards work. They have provided satisfactory service. My sincere thanks to M/S kannan Borewells. We provide well qualified and experienced geological surveyors, geologists and other professionals to identify the bore well points, with a near perfect successful rate. We undertake installation of suitable branded submersible, jet or hand pump sets for the bore wells. 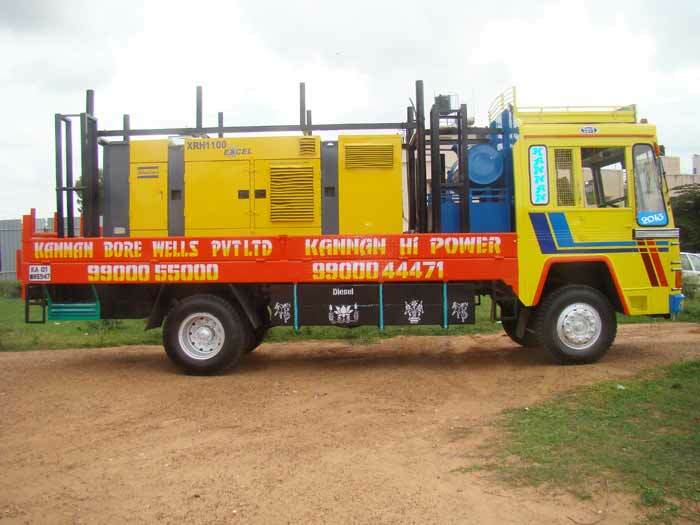 We have expertise in de-silting, flushing and cleaning of existing bore wells. We also undertake rejuvenation work of failed bore wells. We also carry out post drilling and installation services like repair and replacements of pumps. We undertake drilling and installation work of 8", 7½", 7", 6 ½" and 4½" diameter bore wells up to a depth of 1800 ft. for sites, residence, apartments, institutions, industries etc., We carry out our projects with the state-of-the art hydraulic sensor operated rigs mounted on heavy trucks and tripod with auto loading facility. We also undertake slow rig drilling, short hole drilling, earthing boreholes, pile bores, micro piles and ground water recharging boreholes. We execute our projects with different methods depending on the surface and other geological conditions. Rotary drills are capable of two methods of drilling. The majority of the units operate as pure rotary drills, driving tricone or fixed-type bits. The fixed-type bits such as claw or drag bits have no moving parts and cut through rock by shearing it. Thus, these bits are limited to softest material like clay surface. Rotary and DTH (Down- the- hole) is most suitable for highly compact sedimentary strata consisting of clay, compact clay, limestone, sandstone and common Gondwana sedimentary rocks. In the rotary method of drilling, the task is accomplished by rotating a drill pipe by means of a power driven rotary table or hydraulic powered top head drive, with a bit attached to the bottom of the pipe. The bit cuts and breaks up the material as it penetrates the formation. Drilling fluid for mud is pumped through the rotating drill pipe and through holes in the bit. This fluid swirls in the bottom of the hole is picking up material broken by the bit, then flows upward in the space outside the drill pipe, carrying the cuttings to the ground surface and clearing the hole. The greater the fluid flow the faster the drilling. The drill pipe and bit move downward deepening the hole as the operation proceeds. At the surface, drilling mud flows into a ditch to a settling pit where the cuttings settle to the bottom. From the settling pit the fluid overflows into another pit from which it is picked up through the suction hose of the mud pump and re - circulated through the drill pipe. In the Rotary Drilling method, the casing pipe is not introduced until the drilling operations are completed. The walls of the hole are held in place by the pressure of the mud pump against the sides of the hole. Is basically the same as mud drilling except that the mud pump is replaced by a compressor assembly including cooling system, air receiver and unloading system. The air line is connected to the swivel those at the top of the head drive. The air is forced down through the drilling pipe and out through the holes at the bottom of the rotary drill bit. A small stream of water is often introduced into the air system to help cool the drill bit and control the dust. The air serves to cool the drill bit and force cutting out of the hole and is collected at the top. Air is used principally in hard clay or rock formations, once the air pressure is turned off, loose cavy formations would cave-in against the drill pipe. This is not the case when mud is used. The air rotary method of drilling uses compressed air to power a bit that works in a rotary motion. When down, pressure is applied to the drill stem, hammer, and bit (by large hydraulic pistons) the bit is compressed and begins to hammer many times in a second. This hammer chips or grinds away at the formation to gain footage. Water is also sent down the drill stem under pressure to help cool the bit and to wash the cuttings to the surface. The actual drilling process begins by boring through loose and broken formation to find solid bedrock. Once solid bedrock is around, casing is installed to prevent contaminants from entering into the well and to insure the structural integrity of the borehole. Casing will not be required for the full well depth, but only till solid rock. Bentonite is used at the bottom of the casing as well as the top 10 feet of backfill. This will form a protective barrier against contaminated waters entering into your well from the surface of undesirable aquifers. A smaller drill bit is inserted inside the casing and the search for water begins. Once the desired amount of yield is obtained, the well is then developed in order to clean the well of drill cuttings and to circulate the water supply. After completion of the drilling and development of the well, it is sanitized to insure that bacteria were not introduced during the drilling process. We then place a water-tight well cap on the top of the well casing to further protect your water supply. DTH (Down-the-hole) drilling could be carried out rapidly up to 500ft.through weathered medium and massive hard rock formation. In sedimentary and soil strata up to 1300 ft. drilling could be carried out. And in rocky strata up to 300ft. drilling could be executed. Bore well with a diameter of 4½" and 6 ½" could also be drilled inside the open well. The DTH hammer drill is a pneumatically operated bottom-hole drill that efficiently combines the hitting action with the turning action of rotary drilling. The pneumatic drill can be used on any standard rotary rig with an integral or auxiliary air compressor of sufficient capacity. It is applied for fast and economical drilling of medium to extremely hard formations. Fast penetration results from the air piston blows transmitted directly to the bit, so practically no energy is wasted in chewing up cuttings. A straight hole is assured by short, rapid blows that minimize the effect of dipping and broken formations. The hand auger is most suitable for sand, silt and soft clay. Stiff clays, hard materials and ravel are difficult or impossible to drill through with this method. The hand auger is comprised of extendable steel rods, rotated by a handle. A number of different steel drill bits can be attached at the bottom end of the drill rods. The augers are rotated into the ground until they are filled, and then lifted out of the borehole to be emptied. Hand auger can be executed by using a heavy tripod or with lighter materials. It is restricted to generally soft unconsolidated surface or weak weathered rock. It is a method of core drilling performed by the rotation of a steel cylinder and cutting with chilled shot, about 2.4 mm diameter, which cuts a formation core. Circulating water carries the cutting up to a basket like space at the top the core barrel. The core is wedged into the barrel and pulled up one barrel length at a time. Shafts up to 2 mm diameter can be drilled and it can go to a depth of more than 300 meters. Calyx drills are used in sedimentary and clay formation occurring mostly in river banks. We provide well qualified and technically sound geological surveyors for groundwater geophysical survey at reasonable price. The company assures our valued customers a 98% success rate in ground water exploration. We identify the site for bore well purely based on the principles of geophysical investigation using electrical resistivity meter which is highly useful in discovering quality groundwater resource. The depth of water table can also be determined from resistivity survey. Resistivity survey is mainly used to determine the subsoil lithology and to assess the potential of groundwater in the area being investigated. The investigation will also provide us the crucial idea about the probable depth at which water is available to drill accordingly. We also offer drilling work based on the water divinity principle. If the client wishes, traditional water divining techniques too can be employed. Before commencing the bore well drilling work in a specified area, we undertake an exhaustive geophysical prospecting survey to ascertain the type of geological condition and to identify the availability of water source at the site. The quality of water can be influenced by natural factors such as the type of rock, gravel, sand or soil, or by pollution, for example, from poorly managed agriculture or inferior community waste disposal system. Public education about contamination, and community involvement in protecting aquifers, can help ensure safe drinking water. If you plan wisely, good, dependable bore well drilling can supply you with the water for some years. A rule of thumb is that a person can use 75 to 150 gallons per each day. During peak demand, the usage may be higher. Nevertheless, the amount of water expected for domestic supply is usually 4-10 gallons per minute. However, with an adequate storage tank, a well producing as little as one gallon per minute can be sufficient for domestic needs. We not only identify the water source, but also make a survey of the type of rock before going ahead with drilling work. During the survey if saline water is suspected, we need to distinguish the core composed of plastic rocks and adjoining rocks around it. There is going to be a marked difference between core and the enclosing rocks. The core bears all the features of the active dislocation of the plastic masses composing it in the upward direction, while the structure of the enclosing rocks reflects only their passive accommodation to the movement of the core. The contours of the core are characterized by a gentle arch and steep lateral surfaces. In the plan the contours of the core are not the same at different depths. The plastic rocks composing the core are crumpled into narrow and compressed folds, which can be formed only when the substances is in the state of flowing. Individual inter-layers composing these folds are greatly extended; in place however, they form complex bending, clusters, and irregular bulges. The enclosing rock masses at the contact with the core are often fractured and truncated by the plastic rocks of the core. In the proximity of the contact they have a steep form of bedding, often turned upside down or overturned. Numerous ruptures and gliding surfaces are developed within them along which individual members and riders become separated from the rocks that enclose them and follow the core in their dislocation over considerable distances. 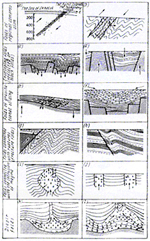 It is by far not always possible to measure the elements of the bedding of layers with the help of the surveyors and diviners' report alone. When the cores of boreholes and the walls of mining works are investigated, the measurement of the elements of bedding and water source becomes very often either totally impossible or can be accomplished only approximately. After the soil test, if the company is satisfied with the quality of the water source, bore well drilling work would commence. Bentonite powder is used to avoid the soil erosion while drilling. Once drilling work is completed with the good yield of water, we take care of the bore well point by installing top safe cap to avoid insects getting inside the bore well. There is also a possibility of particles getting inside through the rainwater harvesting system. Food wastages, drainage pipe leakages during rainy seasons can also harm the bore well water. We take care of these problems with proper advice to our valued customers. There are some areas, wherein bore wells must undergo re-flushing after six month. Particularly in sandy areas where PVC pipes are inserted, during rainy season, small particles can cover the slotted holes even after taking preventive steps. This might lead to low water yield and potentially damage the motor and pump set. Our six months service period would solve such problems. When the company starts the survey work, they scrutinize the type of the sand and the type of the rock, & the water level. Particularly, if saline water comes the company should distinguish the core composed of plastic rocks and the enclosing rocks surrounding it. Besides, we find a marked difference between the structure of the core and the enclosing rocks. The core bears all the features of the active dislocation of the plastic masses composing it in the upward direction, while the structure of the enclosing rocks reflects only their passive accommodation to the movement of the core. The contours of the core are characterized by a gentle arch and steep lateral surfaces. 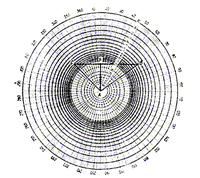 In the plan the contours of the core are not the same at different depths. In this respect the Romna dome in the Ukraine presents no minor interest. The core of the fold, composed of the Devonian rock salt, in the Upper Cretaceous deposits is elongated in the north - west direction parallel to the strike of the Hercynian structures; in Paleogene deposits the core acquire the rounded contours.The inner structure of the core is characterized by an exceptionally complicated arrangement. When the company starts the survey work, they scrutinize the type The plastic rocks composing the core are crumpled into narrow and compressed folds, which can be formed only when the substances is in the state of flowing. Individual inter-layers composing these folds are greatly extended; in place however, they form complex bending, clusters, and irregular bulges. The enclosing rock masses at the contact with the core are often fractured and truncated by the plastic rocks of the core. In the proximity of the contact they have a steep form of bedding, often turned upside down or overturned. Numerous ruptures and gliding surfaces are developed within them along which individual members and riders become separated from the rocks that enclose them and follow the core in their dislocation over considerable distances. The said displacement is accompanied by the development of zones of fracture and fault breccias, which attribute to the structure of enclosing rocks in the contact zone complexity of a very high degree. These dislocations soon die out as the core becomes more remote - and at a distance of several hundred meters from the dislocated zone, they usually disappear altogether. Thus, in diaper structures two types of folds coexist : in the active core there is the development of the flow folds, whereas the rocks surrounding the core and subjected to transverse bending. Above all, the company finds out not only the type of the water, and also the type of the rock and depth of ground water. It is by far not always possible to measure the elements of the bedding of layers with the help of the surveyor's and diviners report alone. When the cores of boreholes and the walls of mining works are investigated, the measurement of the elements of bedding and water source becomes very often either totally impossible or can be accomplished only approximately. After the soil test, the company starts the bore work according to the bore type. In this, they are inserting the slotter, only if the company is satisfied with the quality of the water, quantity of the water & the water level. The company is using the pebbles to filter the water from the fine sand also when required. To avoid the soil erosion we use powerful bentonite powder. In general, after the borewell work no one takes care of the bore till date. i.e., none of the bore well company takes care of the bore well point which leads to dissolving the bore point in future. where as our company using top safe cup which avoids small insects to get inside the borewell. Also there is a possibility of particles coming inside through the rainwater harvesting, also which leads to get destroy of the bore water. To face this problem, our company taking all the necessary steps and advising the parties to get rid of this type of problem in all the times. Moreover, borewell also get destroyed by the food particles near the Borewell in Bangalore, & the dirty water comes inside the bore through the toilet pipes and drainage pipes in rainy seasons. In this situations, our company advising the pros & consequences to all our parties. There are some areas which must undergone re-flushing after six month's time. Particularly in sandy area when we insert the PVC pipe the holes of the slotter will be in 0.5mm to 1.5mm only. In rainy seasons, small sand particles might cover the slotter holes even after taking necessary steps like pebbles packing near the bore, which might leads to the low water level, and also the destroy the condition of motor and the pump set. In this case, our company is giving free service for 6 months to one year and also undertakes short term and long term before protection. 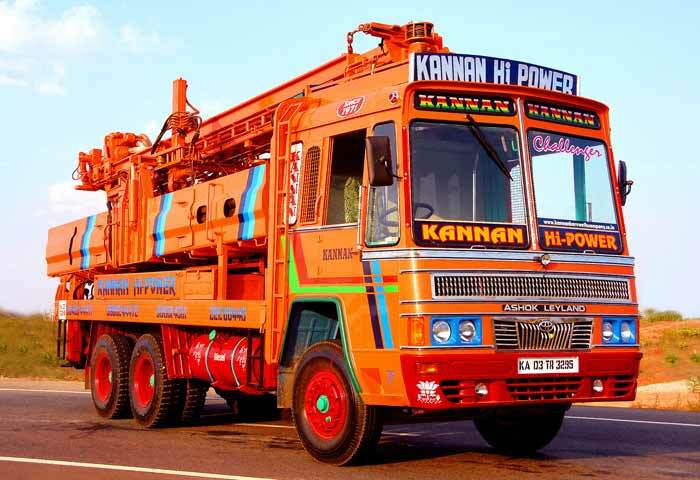 © 2013 Kannan Borewells Pvt Ltd - All Rights Reserved.